When we receive urine contaminated rugs they will go into a submersion bath. There they will be pre treated, then soak in a solution to help release the uric acid and remove the odors, next they will get a deep cleaning followed by multiple rinses. The process may be repeated several times if necessary to insure that we remove all the urine and urine odor. 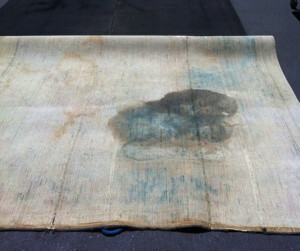 If the urine was on the rug for an extended period of time the urine stains may be permanent. The best action, is to act immediately using our pet urine removal guide. Soak up all the liquid with white towels or paper towels. DO NOT SCRUB. 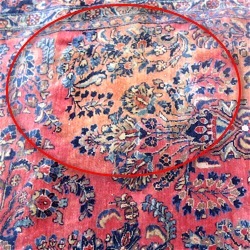 Scrubbing will cause the fibers to unravel which can not be corrected. Use our pet urine removal guide to help you safely remove the urine and to prevent damaging your rug through treatment process. If you have dogs and cats have our pet removal guide on hand with all the supplies kept in a bucket. The time you save not having to look for the supplies may make the difference in your saving rug or not. 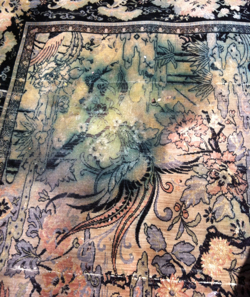 Pet Urine is hot and works quickly to ruin natural fiber rugs.